February 6, 2014 – Church women gathered at the St. Andrews Theological Seminary Chapel to collectively discuss the continuing violence against women and children not only in the domestic sphere but also in the economic, social and political milieu. 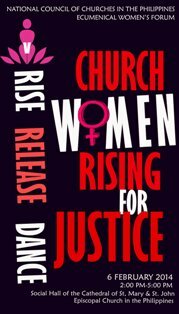 The Church Women Rising is the church’s counterpart of the One Billion Rising (OBR) Campaign that was begun last year. Ms. Gert Libang of Gabriela provided the input on the state of women in our country as a take-off point for discussion. Rev. Marie Sol Villalon of the United Methodist Church shared a Biblico-Theological Reflection on Deborah, a woman leader in the Old Testament to emphasize that women are capable leaders and can make a difference in the world especially in working for justice. Rev. Irma Balaba of the United Church of Christ in the Philippines shared her thoughts on Typhoon Haiayan and how in the midst of disaster, women are still being abused. Finally, the women participated in the OBR dance to express their resistance against all forms of violence against women and children. This year, all women are invited to once again participate in the One Billion Rising Campaign happening on February 14, 2014 at the Ampitheatre of the University of the Philippines, Diliman (UP). Women are requested to assemble in front of the National Housing Authority at 3pm and from there march to UP. Everyone is also invited to the gathering at Mendiola at , at 10:00 a.m., where women will dance the signature OBR dance. Rise! Release! Dance! For Justice.